Israeli home demolitions have displaced more Palestinians so far in 2016 than in all of 2015, according to the UN. Umm al-Khair, Occupied West Bank—The bulldozers arrived early in the morning, rumbling their way through the unpaved road that leads to the small community of Palestinian Bedouins in the rocky South Hebron Hills. Israeli army Jeeps and a contingent of armed soldiers followed suit. Everyone at Umm al-Khair knew why they had come, and a woman started yelling: May God judge you for what you will do. As the roosters crowed, the bulldozers advanced on the first of six small, metal sheet homes, crushing its walls, and turning the entire structure on its side. Within minutes, 35 people were rendered homeless. The tiny village had been through this before, their ramshackle tin sheds and metal dwellings destroyed numerous times. They already led a simple, tough life: Israeli authorities will not connect their community to the power grid, and anything they build - barns for their animals, huts as homes, even lavatories - is eventually destroyed. Among those affected is the patriarch of the community, Suleiman Hathaleen. As he explained that the land belonged to his family, a soldier smirked. When he tried to stand in the way of the bulldozers, in a futile attempt to stop the demolitions, he was shoved aside and at one point carried away by a few soldiers. Israeli authorities say the community is living illegally here. 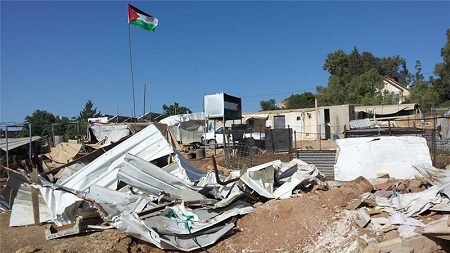 A spokesperson for Israel`s Coordinator of Government Activities in the Territories told Al Jazeera: Last Wednesday, enforcement measures were taken against six illegal structures, which were built without the proper permits in Umm al-Khair after handing all the relevant orders. Hathaleen says otherwise, and shows the deeds to the land on which the village sits and where most of the people from Umm al-Khair were born. The paper is worn-out evidence, he says referring to the number of times he has shown it to authorities, journalists and human rights groups. We are Bedouins from the Jahalin clan originally from Tel Arad in the Negev, Hathaleen said. We bought this land from residents of the nearby town of Yata in 1965 for 100 camels. Just a stone`s throw away from the village is the Israeli settlement of Carmel, built in the 1980s on land belonging to the Hathaleens, its lush gardens, electricity and piped water, standing in stark contrast with the barrenness of Umm al-Khair, where the community is forced to live off the grid and buy tanks of water at exorbitant prices. We went through so many catastrophes: 1948, 1967 and now the settlements, which have taken most of our land, Hathaleen said. They left us with nothing. And now they want to expel us. But we will not leave. The aftermath of the demolition was just as daunting for the families. A pile of metal was all that was left of the houses, along with a mound of crumpled mattresses upholstered with a flower motif, and several carpets. Children walked amid the heaps of blankets looking for things to salvage. A crib survived the destruction, and a baby was laid in it to rest as the day went on. This is the eighth time the Israelis have destroyed these families` homes, said Ibrahim Hathaleen, head of the council of Khashm al-Durj, a nearby village. The army is working in tandem with the settlers to pressure this community to leave. That`s why it`s a constant target for demolitions. He said the community has faced a constant threat of displacement ever since the settlement was built and it continues to expand on to their land. The latest round of destruction in Umm al-Khair comes amid a surge in home demolitions, which has left more Palestinians displaced so far in 2016 than in all of 2015, according to a UN tally. The UN Office for the Coordination of Humanitarian Affairs said the surge in demolitions is the highest in the last seven years. The head of Israel`s military government in the West Bank acknowledged this week that the army destroys Palestinian homes it deems illegal at a faster pace than it does settler houses built without government approval. I want to state unequivocally that enforcement is more severe towards the Palestinians, General Yoav Mordechai told the Knesset sub-committee for Judea and Samaria (West Bank) on Wednesday. 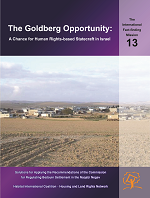 Moreover, much of the enforcement with regard to the Palestinians takes place on private Palestinian land. Umm al-Khair, like 60 percent of the West Bank, is designated under the Oslo Accords as part of Area C, allowing Israel full military and administrative control. Villages and towns in this area are required to apply for building permits, which are rarely given by authorities, leaving them subject to a constant threat of destruction. Photo: Within minutes, 35 Palestinians became homeless as Israeli bulldozers demolished their metal homes in the West Bank village of Umm al-Khair. Source: Tariq and Eid Hathaleen/Al Jazeera.